“Tapas” is probably one of the best known features of Spanish cuisine, outside of paella and sangría. A tapa is like a snack, and It usually isn’t very large, but also it is a bit more than just some potato chips or olives (standards you might receive at pretty much any bar in Spain). Typical tapas includes bread with jamón or chorizo, ensaladilla rusa, or a small slice of tortilla. The tapa may also depend on the bar you are in; for example, in a Andalusian bar, you might receive a tapa typical of that region. Basque bars offer a wide range of delicious tapas (called pintxos), but they are not included in the price of a beverage and must be purchased separately at various prices. 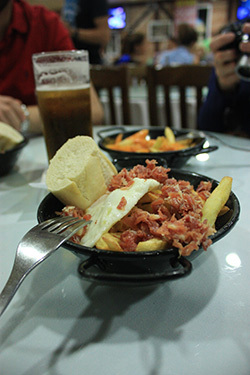 Alcalá is well known for its tapas, and pretty much every bar has its own specialty -sometimes many. There are so many bars where you can indulge in tapas here, that it seems you will never have time to try each one. They tend to offer a sizable tapa of your choice with a drink order, with some of them specializing only in tapas while others also provide the option of a full dining experience. This is very nice for someone looking to discover more about the culinary delights of Spain. Due to their relatively small size, you can usually try two or three tapas, and a great way to pass an afternoon/evening with friends is by going bar hopping and enjoying various drinks and tapas. Be aware that you usually don’t get a tapa with coffee, tea or cocktails. Here at AlcaláNow, we are conducting an ongoing tasting and reviewing of the local tapas joints. This is a daunting task, so please have patience. We will try to get as much information for you as possible. Here is the beginning of our list; make sure to check back as we will be updating it as much as our stomaches will allow. Indalo is an institution in Alcala; it was the first bar in town offering generous tapas, and it has been a standard tapa joint for more than 20 years. You can see on the walls the many famous people that have enjoyed their specialties: calamares (fried squid), ensaladilla rusa, tortilla con jamón (omelet with cured ham),… a must for the tapas aficionado in Alcalá. Located in Calle Mayor, this bar is the oldest in the town center, and it is famous for its champiñones (mushrooms). Since its opening, El Tapón has become a staple on the Alcalá tapas circuit. It is one of the few tapas bars in Alcalá with a young clientele, where you can find typical castilian dishes such as oreja a la plancha (pig ear), morcilla (blood sausage), or zarajo (sheep intestines). My complaint is they don’t have Fanta Limón, but if you don’t mind Kas, then indulge! Also notable to the tapas connoisseur is the variety available. The servings are also quite generous, as in their parent bar, but I must state that the patatas bravas are not of the same quality as those of El Tapón – especially the sauce. This one specializes in cuisine from Andalusia, and they have an exceptional selection of tapas as well as serving raciones and full meals. My favorites include tortilla con pimiento verde (omelet with green pepper) and tempura de verduras con salsa soja (Vegetable tempura with soy sauce). It is located close to the bus station (Continental), along with a variety of other tapas restaurants. 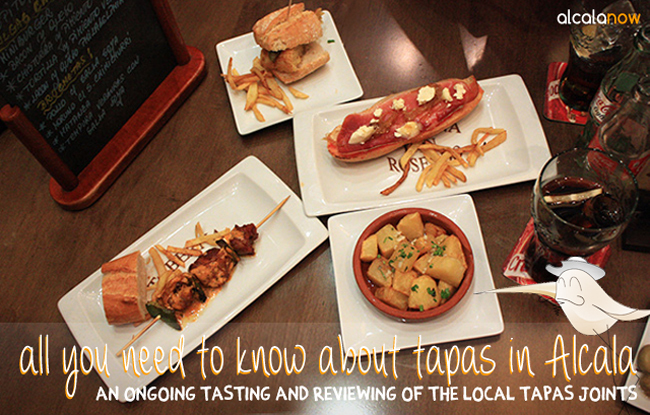 Also known as “La Casa de las Tapas” (The House of Tapas), La Taberna de Rusty is a great place to try out tapas. There is a good variety, and also it is possible to get some entrees at a decent price, such as a hamburger. My favorite tapa is mollete de jamón, berenjena asada y rulo de cabra (mollete is a typical roll from Andalusia topped here with ham, grilled eggplant and a slice of goat cheese). It used to be a “Taberna de Rusty”, but now it serves mostly grilled meats. They offer tapas and menus. We love it! Our favourites: Secreto iberico or panceta, both with chimichurri sauce. There are not many meat-free options here. This is another restaurant/tapas joint in Calle Mayor. Here you can find a large selection of tapas to accompany your drink order, and you can also order raciones (servings) of certain tapas or a full meal. They feature all of the tapas standards such as tortilla española and patatas bravas as well as tostas (toasted bread topped with various items) and pinchos (tapas served on a skewer). There is a wide variety of tapas available with a drink, and some are also available as raciones. I particularly like this bar because of the large selection of vegetarian tapas. Also remarcable is the fact that they indicate which tapas are gluten free. It’s a very good place if you like to drink something while playing cards or board games, since they have a huge number of them, from classics like Trivial or Monopoly to newer ones such as Zombies!! or Game of Thrones. They have a website where you can see all of their tapas selection as well as browse upcoming events, etc. Address: Ronda Pescadería, 27, in the historic area of Alcalá. This is a bar/restaurant, and quite honestly I don’t think you get to chose the tapas that comes with your drink. The times we have visited this establishment, they have served us various tapas including a nice portion of delicious tortilla, and a generous serving of patatas mixtas (potatoes served with two sauces – brava and alioli). The menu is mainly typical Spanish food here, and you can order various types of raciones (servings) of your favorite dishes. The setting is quite nice, and there is outside seating when the weather permits. Address: Calle Cervantes, 2, just off of Calle Mayor. Here is their website. La Casa Rojas is a chain of tapas bars all throughout Alcalá de Henares, with some in Guadalajara. Each one has a type of theme. El Españolito has a tapa named after each city or region of Spain while others have an international theme, etc. Personally I don’t care that much for this chain because of the lack of variety in the tapas, and there is a very small selection for vegetarians or people who don’t eat red meat. They have many locations, and for someone who likes to eat all kinds of food, it is worth a visit to try their tapas and judge for yourself. Las Casas Regionales are something special. You mainly find them in larger cities where people from the more rural regions of Spain migrated to in the 60s and 70s looking for work. They were and still are cultural centers where compatriots gather to drink, eat, dance, etc. And although they do not exit any more in many towns, they are still very active in others: organizing theater or regional dance groups, regional music bands and various other activities. 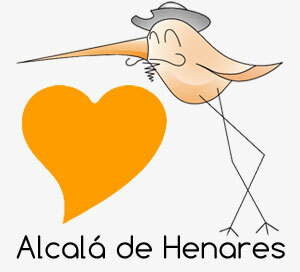 In Alcalá de Henares you can find las Casas Regionales in the old public slaughterhouse. Sounds frightening, but really it is quite nice and there you can choose one of the five bars with typical (and not so typical) specialities from five different regions: Andalucia, Asturias, Castilla-La Mancha, Castilla y León or Extremadura. Our favorites include Andalucía and Extremadura, but each one is delicious and has their own specialty. Their tapas selection is pretty large and the servings are generous. There aren’t many selections for vegetarians. We visited at night, so we don’t have any advice about the churros or breakfasts. It’s worth checking out, but you might have to wait for a table. It is usually very busy with a wide range of cliental. Address: Calle Ramón y Cajal, 7, just off of Calle Mayor. 9 Responses to All you need to know about tasty tapas in Alcala! I do love ‘Casas regionales’, the one from Andalusia is the best. They have quality food, aren’t expensive and you can try out typical dishes. They look homey! My wife and I visited Alcalá in early December and had a great time. We went back to Bar Nino everyday. It’s fantastic. And Jorge’, the bartender/server, is a great entertainer. We’re glad you had a great time! Come back soon!! The best “menu of day” and tapas: “DE JUAN” C/Ramon y Cajal, 7. We have never been there, but we’ll give it a try! I love “El gato”. I visit it since they started and I recommend it because their food has a great quality. Do you mean ‘el gato de tres patas’? It is a great place. I love that they have vegetarian and gluten free options. Thank you for your comment on my post! I so wish we would have had this info before we went. I will definitely have to make another trip out to your gorgeous city!